In collaboration with Comedy Central, Colossal staged an interactive live paint event in Brooklyn for the launch of Broad City’s third season. 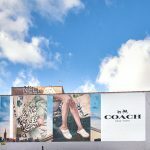 The experiential promotion invited fans of the highly celebrated show to paint a life-sized Broad City mural featuring artwork designed by Mike Perry, the artist behind the series’ opening credits. In preparation for the event, Colossal painters outlined Perry’s artwork on a wall in Williamsburg. They painted color-coded numbers inside each section, custom painted a lift, labeled paint cans, and dipped brushes in anticipation. Comedy Central created a Facebook page for the event, and it wasn’t long before the press picked it up. Features in New York Magazine, The Huffington Post, and USA Today, among others, urged readers to ditch their Saturday plans and come out to Williamsburg to join in the fun. The excitement was contagious, with over a thousand people lining up around the block to paint a portion of the mural. The queue began hours before the event was scheduled to begin. Life sized cardboard cutouts of Abbi and Ilana held it down on the sidewalk, and the shows mascot, Bingo Bronson, came out to bring the hype. Mural artist Mike Perry and actor Arturo Castro, who plays Jaime on the show, both made appearances on the scene. Comedy Central invited participants to warm up, enjoy some free drinks, and dance to a live DJ set at an afterparty inside Kinfolk Studios, the bar on the other side of the wall. Event goers were given Broad City swag, including table-top sized replicas of the mural to color in and bring home. The event exploded on social media. Excited fans shared their photos on the event’s Facebook page and the campaign’s #BC3 hashtag shot to the top trending slot on Instagram.